Do you get FIRED UP about particular ideas and/or activities? What are your passions? Do you live with enthusiasm and inspire others? If you answered yes, then you are aligned with your FIRE energy. If you ignore your gut instincts, are not engaged with deeply meaningful activities, and generally lack inspiration/enthusiasm, then you may be low on FIRE energy. If you work/play hard, without rejuvenation time, you may burn yourself out, physically and emotionally, reflecting the state of excessive FIRE. Not too worry; whether too high or too low, Fire can be tamed to be just right, in the Goldilocks zone. Fire is the warmth of the sun, needed to create the perfect temperature zone for life to exist; it is also the chemistry that digests food to create fuel / nourishment, and transforms toxic residues, whether they be physical, or psychological. Fire is the primary element of Transformation. Mixed Media: Encaustic on birch plywood, fired ceramic forms (slip cast & glazed), wire, paint, paper & beads. 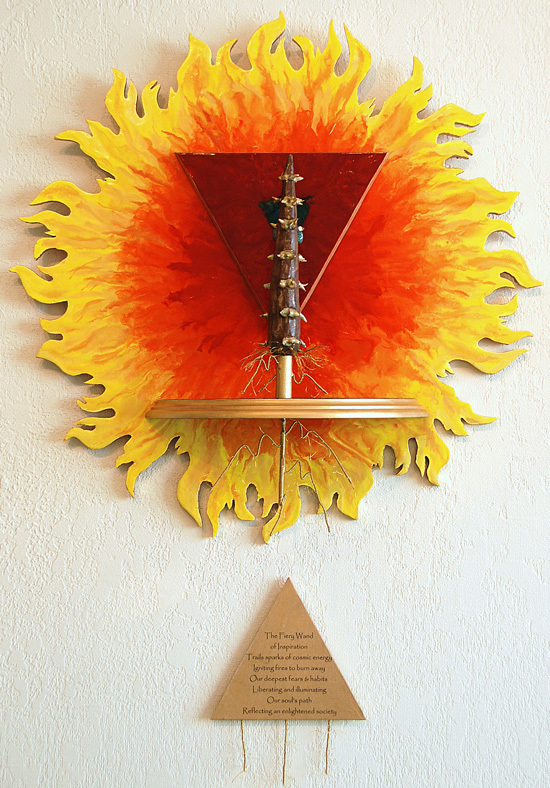 The backdrop is a fiery sun, the core of which holds an alchemical shape of fire, the downward pointing triangle. Sometimes the triangle points up, like the natural movement of flames, and sometimes down, like the direction of celestial warmth from our central star, the sun. The central & vertical ‘wand’ shape, reflects the connection to magic, and the fiery transformation possibility of transforming anything… food into energy; toxic food byproducts into p..p; your enemy into a toad; your list of intentions into reality. What is the process? Is it real? Possible? Dumb Magic? Hard to say, unless you try; testing, trial and error to ascertain what works. Personally, I was born with a LOT of FIRE- I didn’t realize the repercussions of my zealous energies, and kind of enjoyed my history of intense work, crash & burn cycle. Eventually I realized that it was not sustainable, and I had to structure my activities according to a time cycle that included sufficient amounts of rest time. Fire has the wonderful and regrettable association with honesty; over time, I realized my honesty was a little/lot too blunt for some. So I learned to temper that. Meditation, yoga postures and breathing also helped me become more conscious of how to regulate my fiery disposition. As the text illuminates, the subtlest level of transformation is at the spiritual level; we can consciously embrace fire energy to burn up negative perceptions of experience and transform them into wisdom. Our personal efforts and successes contribute to the evolution of human consciousness, from that of being mired in fear, competition and war, to one of love, co-operation and peace. It takes the moment to moment personal reflection of our actions, emotions and thoughts to recognize the patterns that contribute to fire that scorches and burns bridges, and develop skills to regulate the fire element. Balancing the Fire element within may be through engaging purposeful work either professionally, as a volunteer, or as a personal hobby/start up; or exercising/going for walks, to ground the excess fire energy. If low, you can increase your Fire by structuring in activities with strong movements, like Vinyasa/Power yoga, martial arts, and/or strong breathing (Pranayama) practice. Creativity and meditation also brings about greater personal insight and awareness, transforming turbulent emotions and thought forms into fuel for action to shift your life and the world to a more magnificent place. This is all about cultivating, and maintaining your vital life force. I hope that the Art Piece highlighted here inspires a balance within that realm for you. If you are interested in viewing the entire series, click here. And if you want to read about the Earth Element, or Water Element in Art and Life, click on the highlighted text for each.